Perhaps you've heard the tale. An enterprising baker, finding himself conveniently located along the course of an annual bicycle race between the French cities of Paris and Brest, decides to commemorate (and cash in on) the festivities with a pastry designed to resemble the wheels of a bicycle. 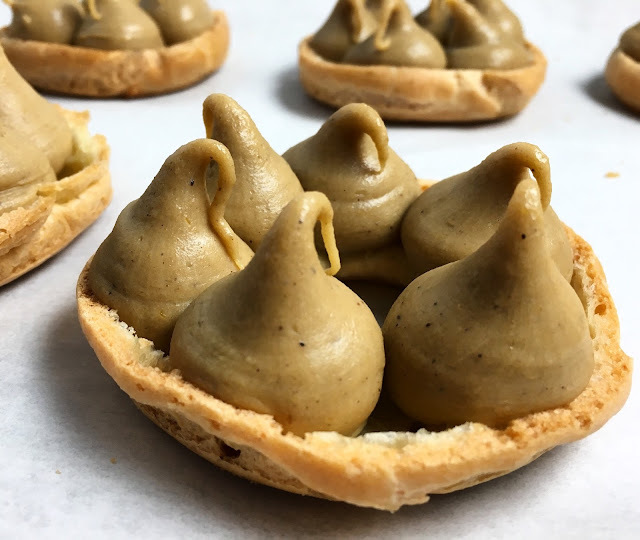 Made from Pate a Choux and filled with a Hazelnut Praline Mousseline (i.e. an unbelievably rich whipped mixture of Pastry Cream, Butter and Praline Paste), this pastry was supposedly relished by the competitors because of its high caloric content. The calorie count cannot be denied. Equally undeniable is the fact that athletes' ideas of pre-race nutrition have certainly changed. Miniature incarnations of the Paris-Brest have become a recent staple of higher-end pastry shops. But many pastry chefs have abandoned the original Mousseline filling, instead using the ring-shaped format as a template for a whole host of flavor combinations, much like an Eclair. With Halloween just around the corner, when it came to my version, Pumpkin was a must. Infused into a White Chocolate Ganache, the Pumpkin filling proves to be just as rich as the traditional Mousseline. To offset the richness, these Paris-Brests are topped with an Apple Cider Glaze. Made from a reduction of Apple Cider, the sharp acidity keeps things in balance. As with many of the best pastry shop creations, making a Paris-Brest comes down to assembling several components. 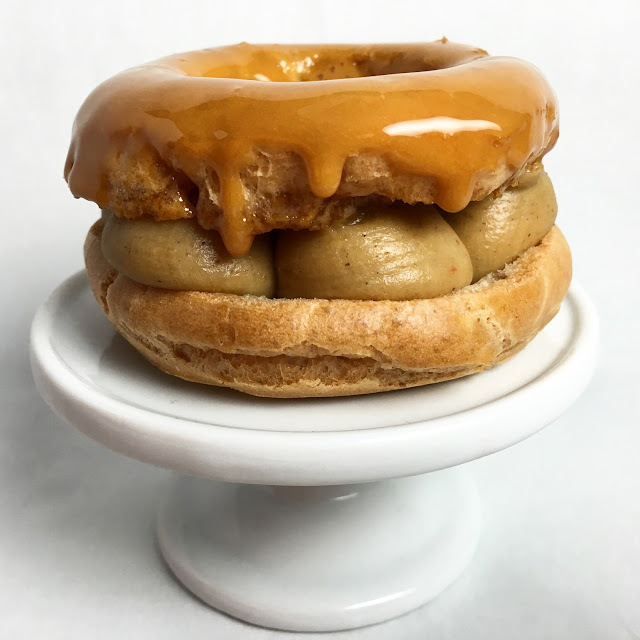 In this instance, there are the rings of Pate a Choux, the White Chocolate Pumpkin Ganache and the Apple Cider Glaze. Each of these components can be made in advance. If you find yourself without a single stretch of uninterrupted time to dedicate to pastry, you can easily approach this as a series of smaller culinary endeavors over the course of several days. 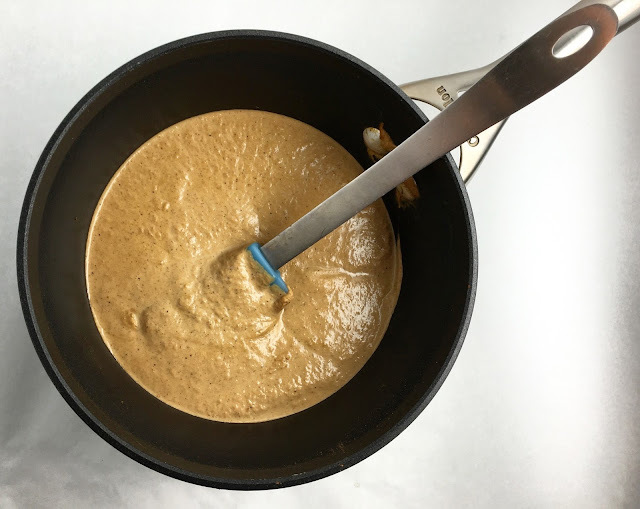 For the rings of the Paris-Brests, start by making a 1/2 batch of Pate a Choux. This will be enough dough to make a dozen 3" diameter Paris-Brests. To guide your piping, it's helpful to make a template by tracing 3" circles on pieces of parchment. Leave sufficient space between each circle because Pate a Choux will expand in the heat of the oven. When you are done tracing your circles, place the parchment ink-side down on a sheet tray. I repeat, place the parchment ink-side down. If you do not flip over the parchment, the ink will transfer to your Paris-Brests. You don't want to have to answer the question, "What's that unique flavor?" with, "It's Sharpie!" 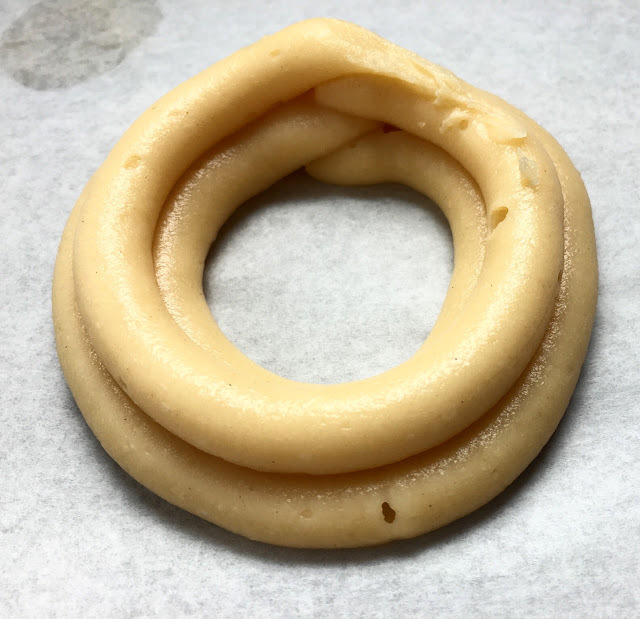 Pipe the rings of Pate a Choux using a pastry bag fitted with a #3 round tip. Pipe three individual rings. Trace your circle template to make the first ring. The second ring is piped directly inside and against that first circle. The final ring is piped on top of the two bottom layer circles. For an impressive rise and a crisp exterior, the Pate a Choux must be baked in an extremely hot oven. One approach is to start the bake at 550 degrees Fahrenheit (288 degrees Celsius) for 10 minutes and then reduce the temperature to 350 degrees Fahrenheit (177 degrees Celsius) until done, usually an additional 20+ minutes. The baked rings should appear completely browned, feel light to touch and sound hollow when tapped. 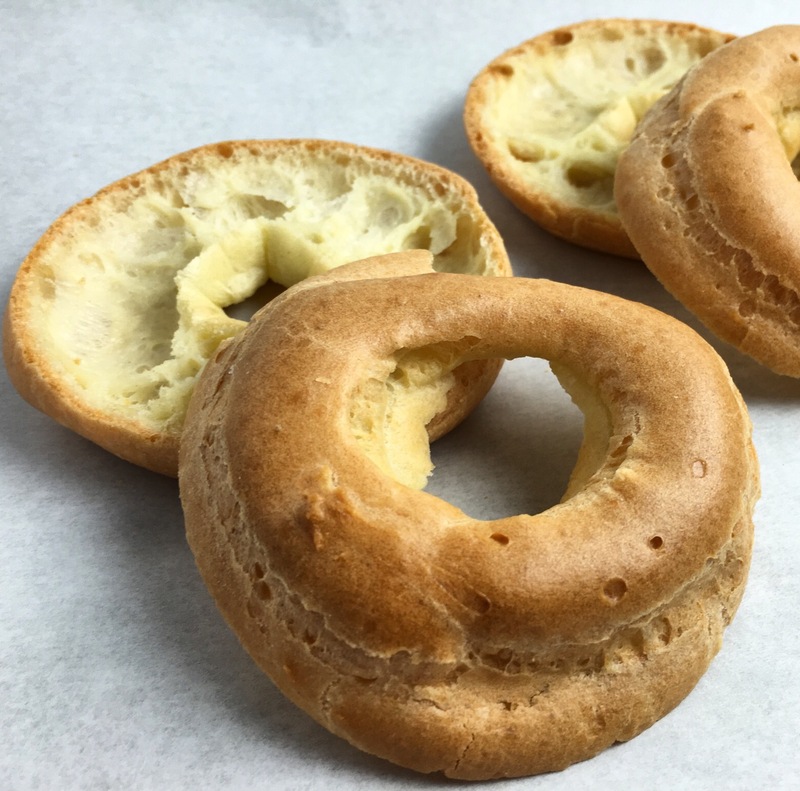 The baked rings can be frozen or stored in an airtight container at room temperature for several days. To restore crispness, place the rings in the oven at 350 degrees Fahrenheit (177 degrees Celsius) for approximately five minutes. The second component for these Paris-Brests is the White Chocolate Pumpkin Ganache. As with the rings of Pate a Choux, the Ganache can be made several days in advance. In fact, it's best to plan ahead as the recipe requires making a Pumpkin Infusion, and the final Ganache works best if it rests overnight before it is used. Start by making a Pumpkin Infusion by heating Heavy Cream, Pumpkin Puree and spices to a gentle simmer. Set the Infusion aside to cool. If you have the time, it's best to let the Infusion rest overnight in the refrigerator. Strain the Pumpkin Infusion through a fine mesh sieve (e.g. a chinois) to remove the coarse fibers of the Pumpkin Puree. The strained Pumpkin Infusion will still be very thick - much thicker than standard Heavy Cream. Your strained yield will vary based on the water content of the Pumpkin Puree and how well you strained the Pumpkin Infusion. Rescale the strained Pumpkin Infusion. If you come up short on the amount required for the recipe (240g or 1 Cup), you can supplement the weight with some additional Heavy Cream. Simultaneously melt White Chocolate over a double boiler and heat the strained Pumpkin Infusion to a gentle simmer. 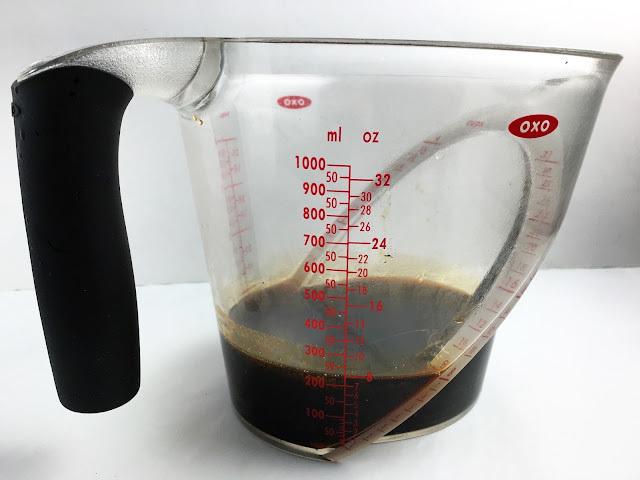 When the Chocolate has melted and the Infusion is warm, pour the Infusion over the Chocolate and emulsify the mixture by stirring with a wooden spoon, spatula or whisk until the ingredients are fully combined and homogeneous. Finish the Ganache by stirring in Butter and Salt. When the Butter is fully incorporated, cover the Ganache with plastic wrap placed directly on the surface and allow the Ganache to set in the refrigerator for a couple hours (or overnight). The White Chocolate Pumpkin Ganache will keep for up to two weeks when refrigerated in an airtight container. 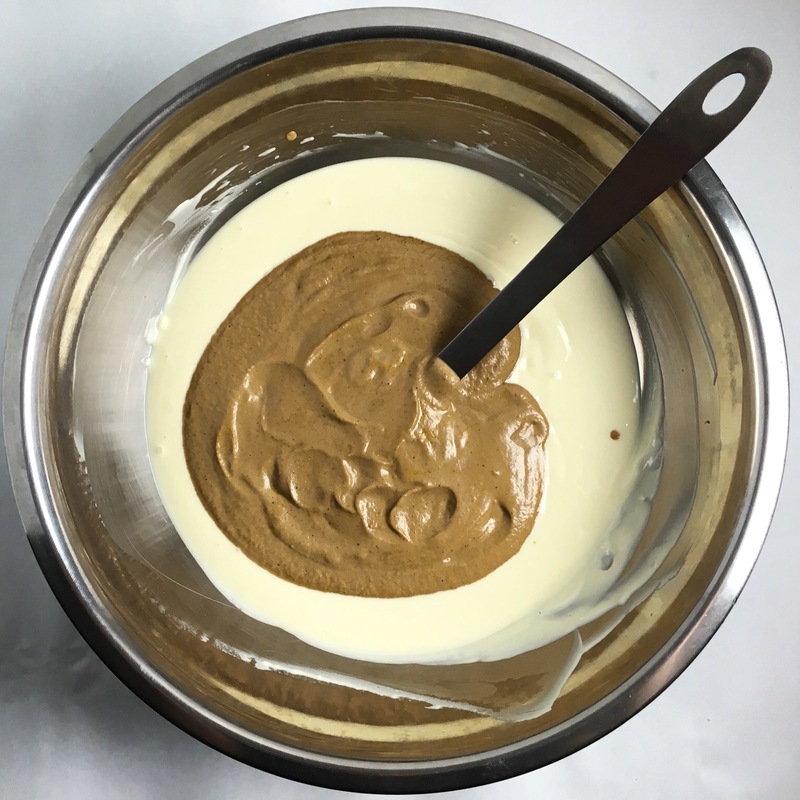 Beat the Ganache smooth in an electric mixer fitted with a paddle attachment before using. The final, and easiest, component for the Paris-Brests is the Apple Cider Glaze. Begin by making a reduction from Apple Cider. Simply heat Apple Cider in a large pot at a gentle simmer (no more intense then gentle bubbling). For an appropriately strong flavor, I recommend reducing Apple Cider by 87.5%. That's not as random as it sounds. 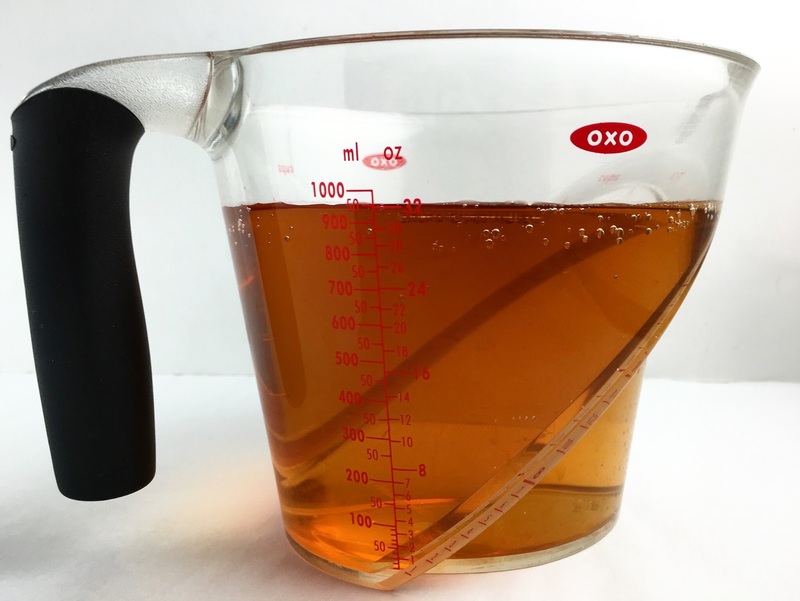 It's the equivalent of reducing one quart (960g) of Apple Cider down to 1/2 cup (120g). Set the Apple Cider Reduction aside to cool. Once the Apple Cider Reduction has cooled, stir in Powdered Sugar, adding a little bit at a time, until the glaze reaches the appropriate consistency. 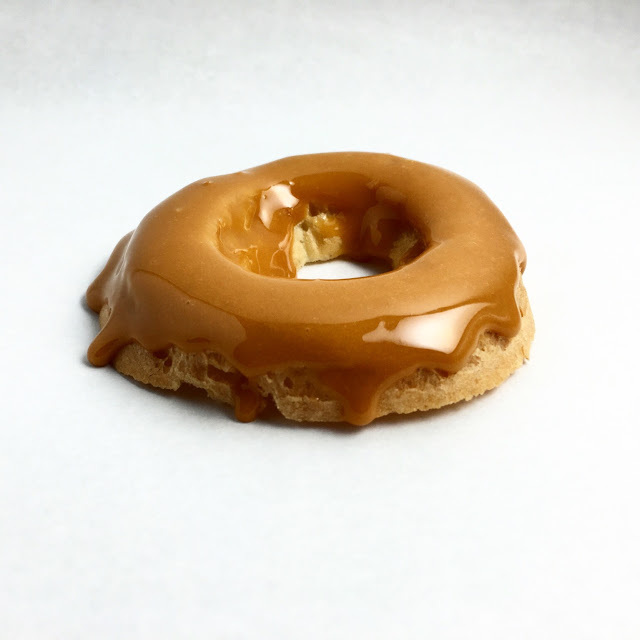 The Apple Cider Glaze should be thick enough so that it does not drip off the Pate a Choux rings when they are dipped; however, the Glaze should remain thin enough so that it flows slowly, does not appear opaque and retains a shine. As a starting point, plan to add 120g (1 Cup) of Powdered Sugar to 120g (1/2 Cup) of the Apple Cider Glaze. If the glaze is too thin, add more Powdered Sugar. If it becomes too thick, add more Apple Cider Reduction or Water. Begin by cutting each of the rings of Pate a Choux in half horizontally. Keep the matching top and bottom slices together. Using a pastry bag fitted with a #4 round tip, pipe a series of mounds of the White Chocolate Pumpkin Ganache inside of each ring bottom. Try to keep the mounds round in shape and consistent in size. Make sure that the mounds are large enough to fill the ring. Finish the ring tops by dipping them in the Apple Cider Glaze. Dip the rings so that there is enough Glaze to completely cover the tops. Allow any excess Glaze to drip off. There should be no Glaze dripping down the sides of the Paris-Brests once assembled. Place the glazed top rings on top of the filled bottom rings. The assembled Paris-Brests are best served the day they are made. If time is an issue, consider making the individual components in advance and then assembling the Paris-Brests on the day that you will serve them. The Paris-Brests can also be stored in the refrigerator in an airtight container for up to two days (although the Glaze will be absorbed into the Pate a Choux over time). The assembled Paris-Brest should not be frozen. 1. Prepare a 1/2 recipe of Pate a Choux and preheat the oven to 550 degrees Fahrenheit (288 degrees Celsius). 2. 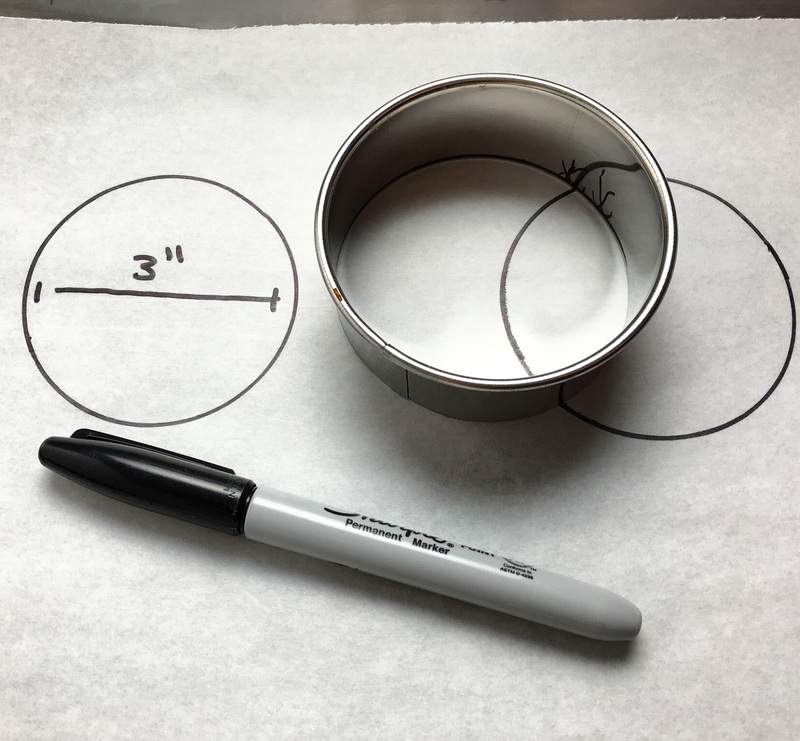 Trace 3" circles on parchment as a piping template. Place the parchment template ink side down on a sheet tray. Prepare a pastry bag with a #3 round tip and fill the pastry bag with the Pate a Choux. 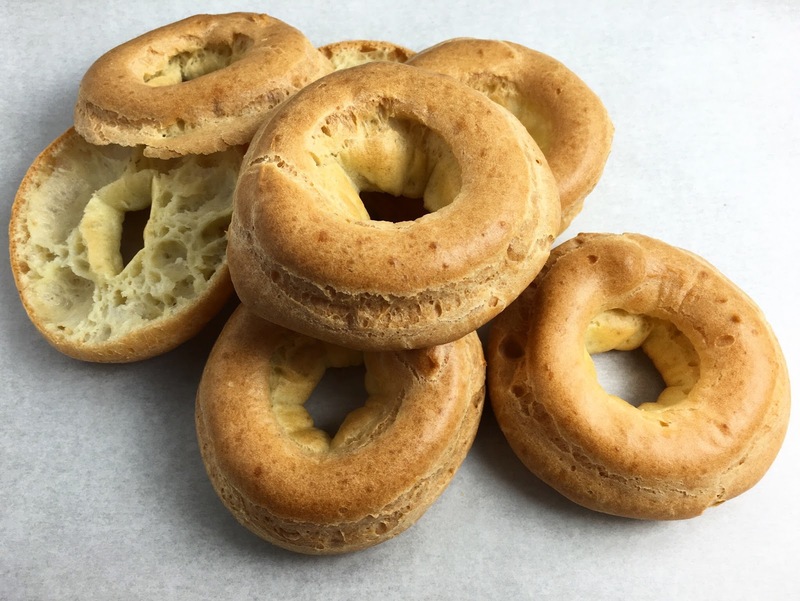 Pipe the Paris-Brest rings of Pate a Choux through a series of three circles. Pipe the first circle of Pate a Choux directly on top of the template. Pipe the second circle directly inside and against the first. Pipe the third circle on top of the two bottom layer circles. 3. Put the Pate a Choux rings in the oven and immediately turn off the heat. Bake the rings for 10 minutes with the oven off. After 10 minutes, rotate the sheet trays and set the oven to 350 degrees Fahrenheit (177 degrees Celsius) to finish baking for an additional 20 minutes or longer. The rings are done when they appear completely browned, feel light to touch and sound hollow when tapped. Set the rings aside to cool. Chef's Note: The rings can be made in advance and frozen or stored in an airtight container at room temperature for several days. To restore crispness, place the rings in the oven at 350 degrees Fahrenheit (177 degrees Celsius) for approximately five minutes. 4. Prepare the White Chocolate Pumpkin Ganache. Begin by making a Pumpkin Infusion. Combine the Heavy Cream, Pumpkin Puree, Cinnamon, Ginger, Nutmeg and Clove in pot and bring to a gentle simmer. Remove the Pumpkin Infusion from the heat, cover and set aside for at least 30 minutes. Ideally, the Pumpkin Infusion should be allowed to rest overnight in the refrigerator. 5. Finely chop the White Chocolate and gently melt it in a large bowl over a double boiler. At the same time, strain the Pumpkin Infusion through a fine mesh sieve (e.g. chinois). Rescale 120g of the Pumpkin Infusion. If you do not yield 120g from the strained Pumpkin Infusion, add additional Cream. Gently reheat the Pumpkin Infusion so that it is very warm but not boiling. Pour the warm Pumpkin Infusion over the melted White Chocolate. 6. 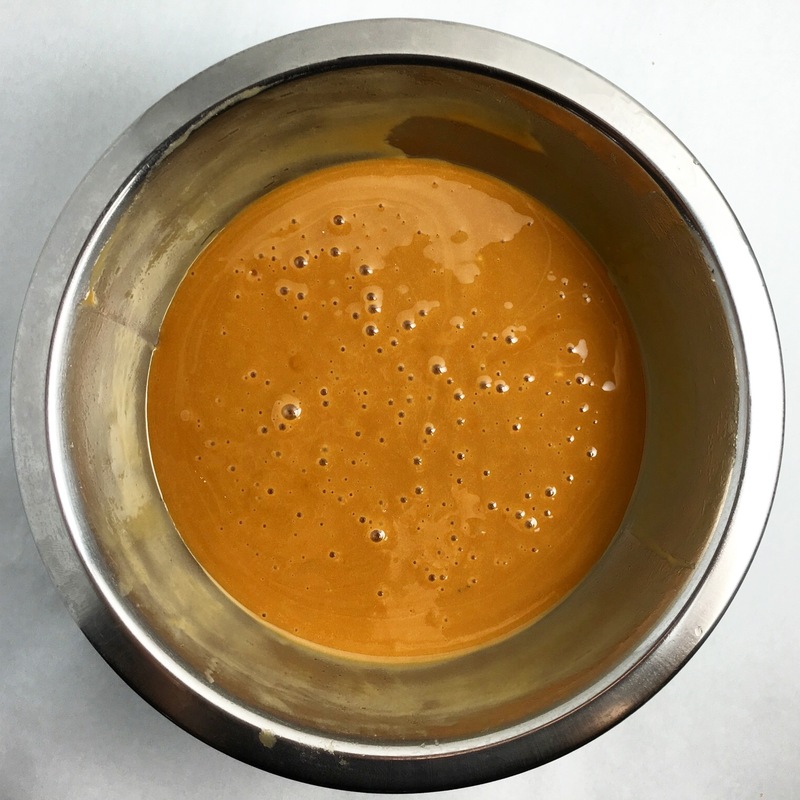 Emulsify the Pumpkin Infusion and melted White Chocolate using a wood spoon, spatula or whisk. Begin by stirring in small circles at the center of the bowl, slowly working outwards as the Pumpkin Infusion and melted White Chocolate come together. Continue stirring until the mixture is completely combined and homogeneous. Once the Ganache has come together, add the cubed Butter and Salt. Stir the mixture until the Butter is completely melted and all of the ingredients are well combined. Cover the Ganache with plastic wrap placed directly on the surface and allow the Ganache to set in the refrigerator for a couple hours (or overnight). Chef's Note: Use room temperature Butter that has been cubed into small pieces. It will be easier to incorporate into the Ganache. 7. Prepare the Apple Cider Glaze. Heat the Apple Cider in a large pot at a gentle simmer until it is reduced to 120g (1/2 cup). This may take up to 90 minutes. Set the Apple Cider Reduction aside to cool. Chef's Note: Keep a close eye on the Apple Cider. As it reduces, it should form a syrup. However, if left to reduce too long, it may begin to caramelize and then burn. 8. Slowly stir the Powdered Sugar into the Apple Cider Reduction. Continue adding Powdered Sugar until the desired consistency is achieved. This may require more or less than 120g (1 Cup) of Powdered Sugar. 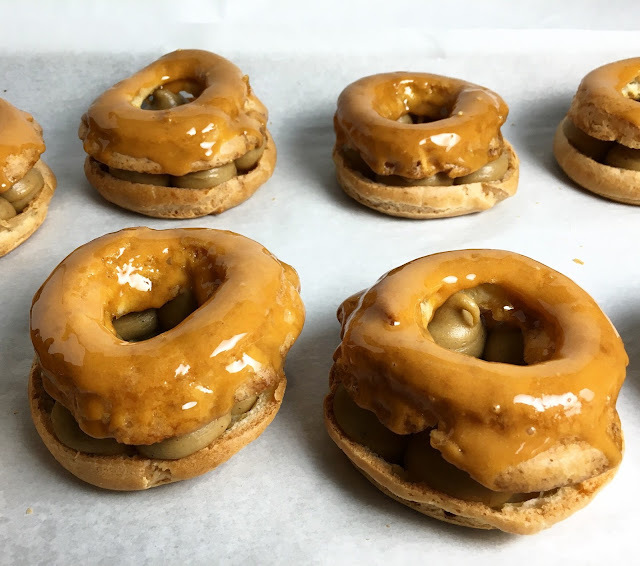 Chef's Note: The Apple Cider Glaze should be thick enough so that it does not drip off the Pate a Choux rings when they are dipped; however, the Glaze should remain thin enough so that it flows slowly, does not appear opaque and retains a shine. 9. Assemble the Paris-Brests. Cut each Pate a Choux ring in half horizontally. 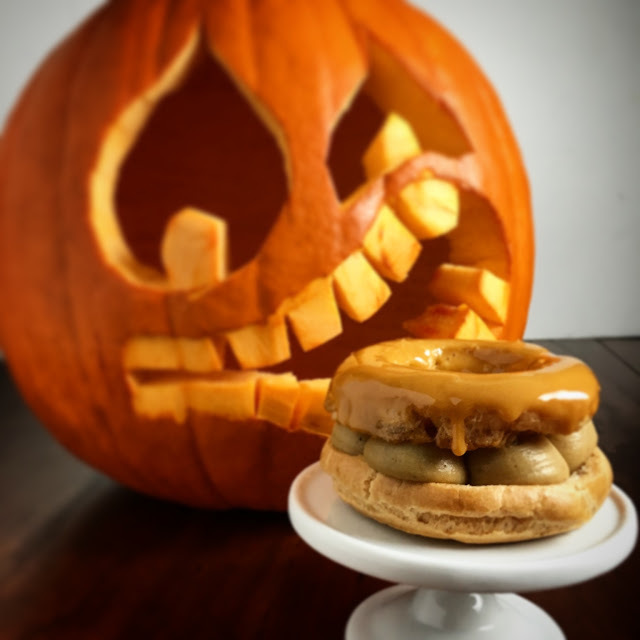 Using a pastry bag fitted with a #4 round tip, pipe a series of round, consistently-sized dollops of White Chocolate Pumpkin Ganache filling the bottom pieces of each ring. Dip the top pieces of each ring in the Apple Cider Glaze, allowing any excess Glaze to drip off. Place the glazed top rings on top of the bottom filled rings. - The assembled Paris-Brests are best served the day they are made. The individual components can be made in advanced and assembled on the day the Paris-Brests will be served. - The Paris-Brests can be stored in the refrigerator in an airtight contain for up to two days (although the Glaze will be absorbed into the Pate a Choux over time). - The assembled Paris-Brests should not be frozen.